Hotel Napoleon Paris made its grand debut as an opulent addition to the Parisian skyline in the 1920s, amid the city’s influx of literary and artistic expatriates, including “The Lost Generation” writers, Ernest Hemingway, F. Scott Fitzgerald, and Gertrude Stein, artistic icons Pablo Picasso and Salvador Dali, and famed surrealist thinker André Breton. Quickly purchased by a wealthy Russian businessman as a symbol of love for his French bride, the seven-story Art Deco hotel has through the years remained an undeniably romantic and flirtatious retreat, offering private terraces with views of the Eiffel Tower or Arc de Triomph and an enviable location, in the Triangle d’Or, from which to explore the City of Lights. Once host to luminaries such as Errol Flynn, Orson Welles, Jean Gabin, and Josephine Baker, this newly enhanced five-star Parisian icon blends rich history with modern comfort, creating an inimitable sense of warmth, charm, and character.” Here, guests will discover spacious accommodations impeccably decorated in Napoleonic fashion by interior design firm Malphettes & Biz. Guestrooms include marbled and mahogany baths, and the elegant, home-like suites are outfitted in silken fabrics and a variety of vibrant color hues, including crimson, saffron, and turquoise. 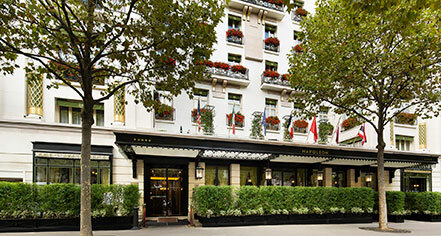 Passed from generation to generation, the Hotel Napoleon Paris remains in the family of its original owners and serves as a treasured landmark, storied in history anfd brimming in charm amid the most recognizable shops, museums, and cultural sites of Paris. 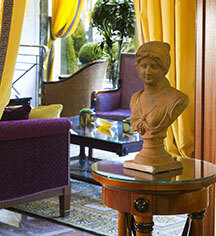 Hotel Napoleon Paris, a charter member of Historic Hotels Worldwide since 2011, dates back to 1928. Hotel Napoleon Paris has served as the location for a variety of films, namely Jean Gabin pictures of the 1930s, and shares a lengthy cinematographic history. Hotel/Resort Fees & Taxes: ; Resort fee: Please contact hotel for more information. Taxes: a tax is imposed by the city: EUR 3.30 per person, per night. Pet Policy: Service animals allowed: Yes. Pets allowed: Yes. Dogs and Cats. Maximum amount: 1 pet per room. Hotel Napoleon Paris made its grand debut as an opulent addition to the Parisian skyline in the 1920s, amid the city’s influx of literary and artistic expatriates, including “The Lost Generation” writers, Ernest Hemingway, F.
Learn more about the History of Hotel Napoleon Paris .